The Security Council has formally approved a first-ever joint United Nations mission with the Nobel Peace Prize-winning global chemical weapons watchdog to oversee the destruction of Syria’s stockpiles and production facilities. In a letter to Secretary-General Ban Ki-moon, the Council today endorsed the UN chief’s plan to deploy up to 100 United Nations and Organization for the Prohibition of Chemical Weapons (OPCW) experts in a multi-phase operation to carry out last month’s Council resolution on eliminating Syria’s chemical weapons material and equipment, scheduled for completion by 30 June, 2014. The Council passed its resolution after Syria agreed to join the Chemical Weapons Convention following a chemical weapons attack in August that killed hundreds of people in a Damascus suburb, an “especially disturbing” event in a conflict that has already killed over 100,000 people and driven some 6.5 million others from their homes since protesters first sought the ouster of President Bashar al-Assad’s Government in March, 2011. Responding to the Council’s decision to approve the joint mission, Mr. Ban said in a video message he was “very pleased” the 15-member body moved so quickly on his recommendation. “This is a sign of the international community’s commitment to eliminate chemical weapons,” he added. The physical destruction of chemical weapons facilities, stocks and associated material is the responsibility of the Syrian Government, since neither the OPCW nor the UN is mandated to conduct actual destruction activities. An advance team of experts and support staff from the OPCW and the UN has been in Syria since earlier in the month and has already begun overseeing the destruction of Syria’s production facilities amid the ongoing deadly violence in the country. The UN earlier reported that mortar fire had struck near the Damascus hotel where the advance team has initially based its operations just hours before it arrived. Today, the UN and the OPCW report that the advance team has made “good progress” since it began its operations. “At the end of the first 10 days of operations on the ground the verification teams have inspected three sites and plans are underway for further site visits,” the organizations say in a joint news release. 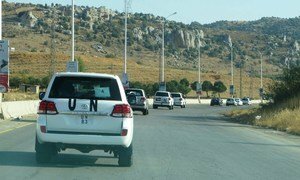 A second group of inspectors from the OPCW and additional UN support staff also arrived today in Damascus, bringing to about 60 the number of people on the advance team. The release noted that since the OPCW has received initial and supplementary information from the Syrian Government on its chemical weapons programme, it is now in the process of verifying that information. It has also overseen the destruction by Syria of some of its munitions stockpile as well as some of its chemical weapons production equipment. On Wednesday, the OPCW’s Director-General, Ahmet Üzümcü, said the first verification activities have to be completed by the end of this month and production facilities will have to be rendered unusable by that time as well, with the view of destroying all chemical weapons capabilities by mid-2014. Meanwhile, the spokesperson for the Office for the Coordination of Humanitarian Affairs (OCHA), Jans Laerke, warned that soaring food prices, the unavailability of food for children, displacement and loss of income have made it difficult to provide Syrian children with adequate healthcare and nutrition. In addition, the number of children admitted to hospitals with severe or acute malnutrition has reportedly increased in Aleppo, Dar’a Deir-ez-Zor, Hama, Homs and other areas, Mr. Laerke said. He added that humanitarian agencies in Syria are also preparing to adapt their response, as winter approaches. Partners working in the shelter sector have begun stocking items such as warm clothes, thermal blankets and hot water bottles. They are also preparing to assist the displaced families living in damaged and collective shelters by insulating the shelters against the freezing temperatures during winter.